Plot sign for early experiments on the Crossett Experimental Forest. Photo by USFS. Methods other than clearcutting often find considerable interest on private family forest as well as public lands. There’s no better place in the South to see this variety of successful practices than at the Crossett Experimental Forest, which is rightly venerated for its role as a field laboratory and demonstration site for good forest management. 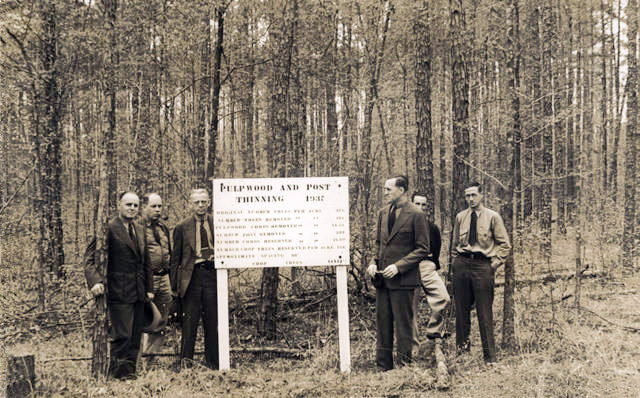 In 1934, the Crossett Lumber Company, later acquired by Georgia-Pacific, deeded the land for the experimental forest to the Southern Forest Experiment Station (now the Southern Research Station) with a 50-year agreement that committed the Station to return an amount of timber equal to what was present on the deeded land at the time of the agreement. In short order, founding Station scientist Russ Reynolds succeeded in delivering on this commitment and leaving the forest better stocked than it was at the time of the takeover. Read The Crossett Story, written by Reynolds in 1980. With the rise of plantation forestry in the 1960s, the work at the Crossett Experimental Forest was thought for a while to be out of date. But time has shown the wisdom behind the silvicultural tactics put to work there: they still provide foresters with a diversity of viable management tools needed to meet the range of forest ownership goals in the 21st century. Since those early days, the Crossett Experimental Forest has had few peers as a research and demonstration forest. 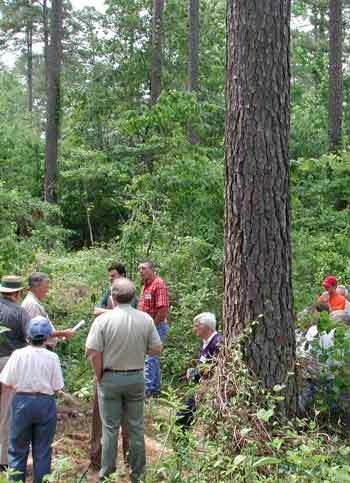 Over the decades, thousands of foresters, landowners, scientists, students, and teachers have visited the Farm Forestry Demonstration areas to learn about selection methods in southern pines, studying stands managed with that technique for 75 years. These outreach efforts have also been instrumental in helping national forests in the South move away from intensive plantations and toward management that relies on natural regeneration and that maintains continuous forest cover. Recent forestry tour on the Crossett Experimental Forest. Photo by USFS. Station scientists also continue to develop tools to help create and manage old-growth-like stands, as well as understanding the impacts of not treating forests. The 80-acre Reynolds Research Natural Area is used to study the ecology of stand development in the absence of management. Recent studies have used both old and new research on the Crossett Experimental Forest to better understand patterns of biomass accumulation and the role of naturally regenerated, managed southern pine stands in the provision of ecosystems services. Station scientists, along with University and forest industry experts, are also responsible for the southern pine module of the National Advanced Silviculture Program (NASP) used to certify Forest Service field foresters to apply silvicultural prescriptions on national forest lands. For more information, email Jim Guldin at jguldin@fs.fed.us. The Southern Research Station is currently evaluating the role of our existing experimental forests in providing data and answers to the critical forest management questions identified in assessments such as the Southern Forest Futures Project, towards developing a functional experimental forest network that would also address the needs of our partners and publics. For more information, please visit: http://forests4thefuture.info/research/experimental-forest-network-re-design.